The following 5 steps will help you save a lot of time, money and headaches when you are ready to send your tracks to a professional mix engineer. In my experience, this step is the first obstacle. Importing your tracks into the DAW of choice for the mix engineer. There are several things you can do here to make this go quickly and avoid issues. Firstly, go through your session and number your tracks. Most DAWs will import your files in alphabetical order. As a result if you don’t do this, the first job your engineer will be doing is ordering and grouping tracks together into their instruments. This can take quite a while especially if there are a large number of tracks. By simply applying a number before the name of each track i.e. 01 Kick In, 02 Kick Out, 03 Snare Top etc. the tracks will import into the DAW the engineer is using in the correct order as you have them in your session. From experience if everyone did this, it would have saved me quite literally days of time across my career so far. Make sure your tracks are named correctly. By which I mean that they all have what instrument is on each track. Chances are your engineer wont know who Barry, Steve or Bob is let alone what they play. Make sure they have appropriate naming. This is how your tracks should look like before sending off to mix. Keep the naming consistent between each song. This is important, as the engineer will want to pull in settings between each song for instruments that remain consistent within the project. If they are all named the same then this process is easy, as the DAW will be importing session settings to each track that has identical naming and numbering. Make a document to include with the song folder that details the numbering system. Write down the track naming for each song (one text document per song is fine) make a note next to each track mentioning weather the track name/ number is consistent across all songs or unique to the song in the folder. This way it is clear what tracks are unique and wont be appearing in other songs. You can also use this document to make notes on tempo, time signature, key and if there are any changes to those throughout the song using the bar/beat number as a reference i.e. a written tempo map. I will get to tempo maps later on (See Step 3). The next hurdle is editing and consolidation ready to export your tracks. It is a good idea early on in the process of booking a mix engineer to decide who is editing the song (if it is required). I have had some less than ideal conversations with clients who have presumed it was my job to edit the song as well as mix. It is not always a given that the person you are sending it to is going to do this for you so the best thing to do is simply ask. Ask if editing, pitch correction, comping takes etc. is included or will it be an extra cost. This avoids headaches and gives you an idea of the expectations of your chosen mix engineer. If there are alternate/ several takes of some parts. It is a good idea to either commit to a take or “comped” version of the part or provide each take as a separate file (with appropriate naming by putting take 1, take 2 etc. on the end of each file) if your engineer is editing for you. If you are editing the files, please make sure there is a cross fade on EVERY edit. Also, do all appropriate fade-in and fade-outs. I have had tracks sent that have clicks, pops and generally unpleasant sounding edits. A cross fade between edits would have solved all of these problems. This will save both parties time with not having to have that conversation. Make sure you are including dry tracks of anything that has had an effect added as well as an effected track if it is essential to a part in the song. This way your mix engineer has ultimate control to either recreate the effect perhaps in a different or better way as well as giving the option to use your effected version. Also include DI tracks for guitar and bass guitar. This is for a similar reason as it will allow your mix engineer the ability to re-amp if required and use these files to create additional layers or textures within the mix and create more impact/ fix perhaps a less than idea guitar/ bass sound. Make sure each track in the project is consolidated back to the 0 point of the song. This means that you are creating a single file that starts at the very beginning of the session and runs until the track finishes. Every DAW has a way of doing this. If you are unsure on how to do this within your DAW? Pop it into Google or YouTube. I am certain you will find a useful tutorial to allow you to do this. 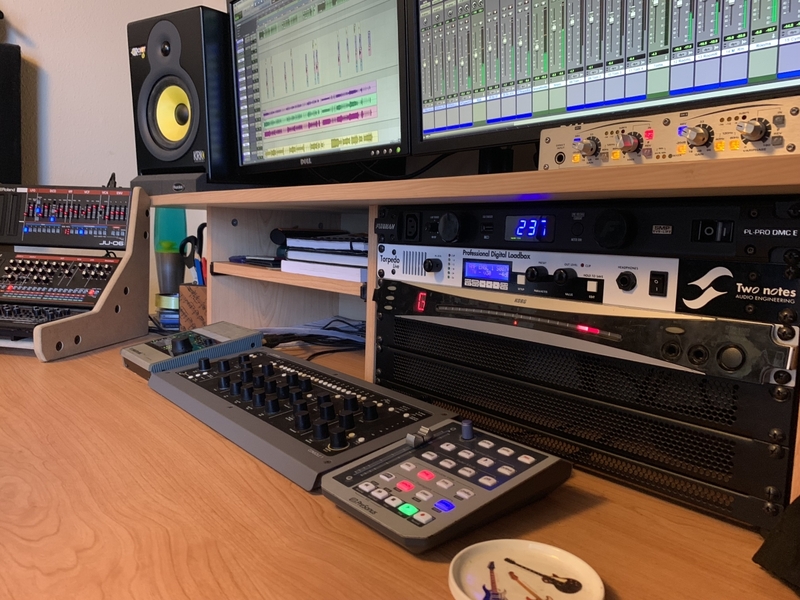 The reason for this is so that when the mix engineer is importing your tracks, they all line up and all the parts of your song appear in the correct place on the timeline. Consolidating tracks is essential. It will save your mix engineer a lot of time and most importantly, save you money! Otherwise it will take a lot of back and forth with the client, hours of time and headaches playing sonic jigsaw getting your song back together! Export the tracks in WAV format. This is the universal standard. Export the files at the same sample rate and bit depth as your session. Make a note of what that is on your document you have created for the song which I mentioned earlier as this will again save time and guess work. Make sure mono sources are exported as mono and stereo as stereo. Keyboards, overheads/ rooms, stereo miced instruments etc. should be the only tracks you export as stereo. The rest should be mono. DO NOT EXPORT EVERYTHING AS STEREO! This is by far the biggest pet hate of mine as a mixer when you import everything and you have to spend ages getting mono sources e.g. Kick, Snare and Bass back into mono. The last thing to include in each songs folder is a tempo map. 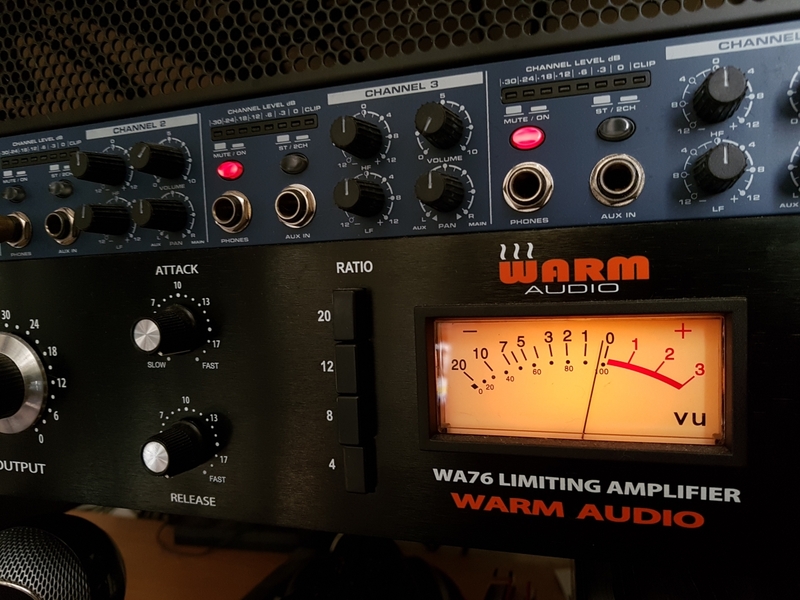 This is essential for a number of processes in mixing but mainly for time dependent effects such as delay, which rely on the tempo/BPM of the song. This is even more essential if the engineer is editing for you so that they have an appropriate grid to work with in their DAW. 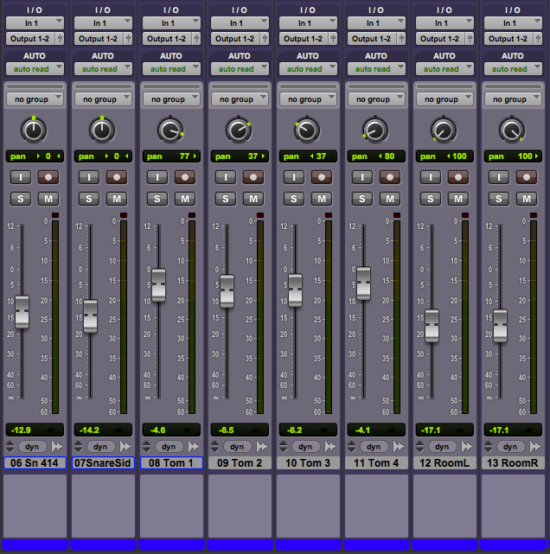 An example of a Tempo Map in Pro Tools. Of course, this can be created in any DAW. You can do this by exporting a MIDI file that is the length of the song. Most DAWs allow you to do this and this will give the engineer the tempo, meter and any change in those two. You can also include in this any marker tracks that tell the engineer what sections are which e.g. Intro, Verse and Chorus. It is a good idea to include any marker locations in the document I mentioned earlier. Manual entry can then happen if the MIDI file does not include them. 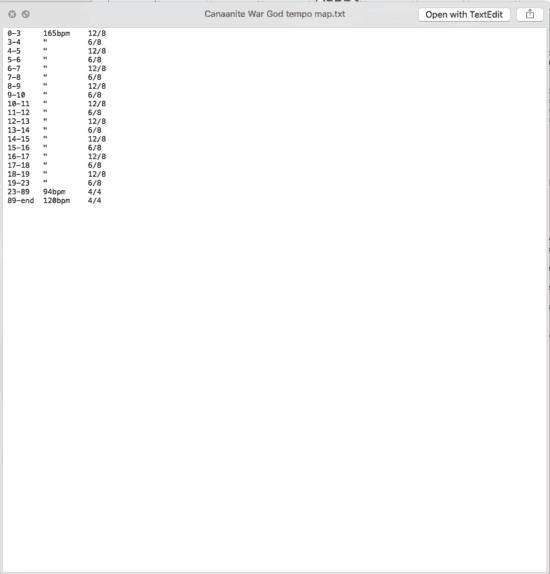 If you’re more comfortable with writing down the tempo map as a text file, that’s fine too! It’s time to get everything organised. 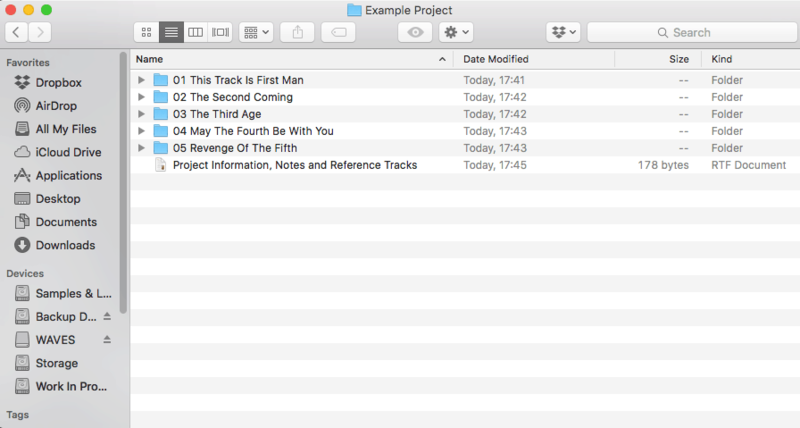 Create a folder that has the title of the project on it and then within that, create a folder for each song and name it with the correct final title of each song (No working titles at this stage). This is how you should be delivering your files to the mix engineer. Number those folders so they appear in the track order that the project will be in. Your engineer may mix in order. This allows delivery back to you in the correct order. Export your tracks into each songs folder, add your text document of information and tempo map for each song into each songs folder. Then perhaps add another document detailing any additional notes for the project as a whole, reference tracks for the engineer to refer to and any other relevant information. Check before hand how they prefer to receive files. Do they use Drop box or We Transfer? FTP server? Are they old school and want it delivered on a hard drive/ thumb drive? Check before hand and if you are not sure of how to do anything, ask! Next establish the turn around time for your mixes. How long will it be before your engineer will be giving you the first version of the mixed project for approval? The last thing the engineer needs is a band chasing them the day after getting the tracks for an album. Mixes take time to get right. Establish how long it will be ahead of time. This way you have it in writing and know when to expect your mixes back. A mix revision is a chance to list any changes you would like made to the mix. The engineer will then perform those changes. Some engineers have a number of times they will do revisions. Then there will be an additional fee per revision following this. Some engineers have unlimited revisions. Double-check this in advance. On the subject of mix revisions, check how your engineer wants these notes delivered. Have a meeting and put all changes in to a single e-mail so I can refer to that as I perform the revision. That way I don’t miss the Facebook message or text from one of the band members asking for a change. Or compile a list myself in order to perform the revisions and ensure everyone is happy with the final product. Now you have the steps required to submit your tracks to a professional for mixing. Happy tracking!